When you compare the kind of access equipment that we supply at Force with the alternatives, it seems secure and easy to use. After all, a mobile platform feels more stable and is less effort to work from than a ladder, and unlike scaffolding, it’s easy to move into various positions around a work site, and it doesn’t require a time consuming, tiring and dangerous climb. However, mobile platforms like the ones found on scissor lifts, boom lifts and knuckle booms do pose a number of hazards if you are not alert and aware of the risks involved while using them. Depending on the job you’re doing and on the characteristics of the worksite, they may require the use of specialised safety gear, but as always, a constant awareness of both the work and the surrounding area is the best way to avoid injury. Booms, lifts and other access equipment that is intended for carrying people rather than materials is always equipped with platform railings. Luckily programs Force has in place, like our quality assurance program and safety checks makes certain that the railings on your equipment are secure. However you can never be too safe, each time you use the equipment, check to make sure that the railings are secure, and avoid leaning over them as you work. 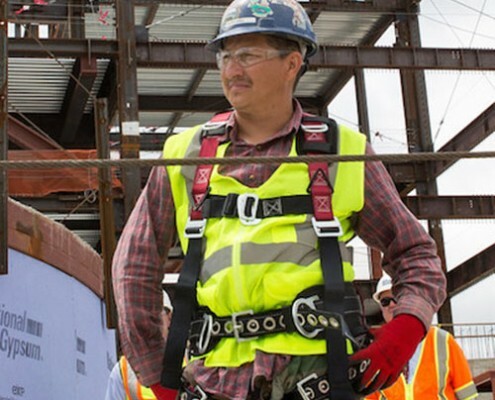 Safety gear like fall arrest harnesses and safety lines can help to reduce the risk of injury from a fall, but of course it’s more effective to avoid falling in the first place. When working at height, there’s always a risk of falling, and that’s the risk that most people are hyper-aware of, as they should be. Don’t forget about the other major risk: having something fall on you. Of course, the risk of being struck by falling material is always present on construction sites and on some other types of worksites, too. That’s why everyone has to wear a hardhat. However, the risk of being struck by falling material is even greater when you’re trapped on a relatively small elevated platform and dodging is difficult to impossible. So, don’t forget your head protection gear, and think twice about where and when to use the access equipment. The best way to avoid injury while using access equipment is to keep your eyes open, stay aware and think things through in advance. It’s important to understand any hazards you may come across while up in the air, doing your job. However, it’s even more important to plan placement and access so that risk is minimised. Of course, this is just a general overview of how you can do all you can to be safe. 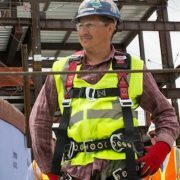 Consult an expert on worksite health and safety to find out about specific government requirements for the type of work you’re doing, and ask about any special company or job site rules, as well. Working at height is always risky; staying fully alert to your surroundings can be difficult when you’re concentrating on your job. Don’t leave your safety to chance. Make a constant effort to stay aware of what’s happening around you, and always use the appropriate safety gear.